Tigerfish is one of the very first friends I made through blogging and we even met up one time! She is a really sweet person and Teczcape is her cooking journal of everyday recipes. Please welcome Teczcape to Rasa Malaysia. For those who celebrate Chinese/Lunar New Year, Happy Tiger Year, Gong Xi Fa Cai (恭喜发财). To get more Chinese recipes and ideas, please check out the complete list of my Chinese recipes index and this Chinese New Year Recipes post from last year. You might also want to check out Steamy Kitchen. One of the great Chinese physicians—Li ShiZhen (李时珍) rates highly on pine nuts for medicinal benefit. Not only they reinforce the brain functions and delay the aging process, pine nuts contain essential vitamins and minerals such as thiamine, vitamin B1 and protein; and nourish/balance the essential bodily functions. With the nutritional benefit, I consider it a healing food, being rather neutral and neither too “heaty” or “cooling”. Indeed, this will be a great addition to balance an otherwise “meaty” (大鱼大肉) feast you will be having this Lunar New Year. Yes, it is also totally vegetarian. Vegetarians are in for a delectable treat. The natural sweetness of sweet peas and corn kernels complements very well with the slight bittersweet in pine nuts and a little spice from the ginger slices. The array of flavors is enormous even though the ingredients are all “small” in size. I love the tender crisp textures in the dish too. This Stir-Fry Pine Nuts, Corn and Sweet Peas (清炒松子玉米甜豆) of yellow-golden (pine nuts and corn) and jade-green (sweet peas) symbolizes 金玉满堂: that prosperity and fortune (金, jin:gold and 玉, yu:jade) fills your entire household and home. Personally, I like this recipe very much because there is not much preparation required (rinsing and cutting of vegetable is reduced to a minimal! ), it is easy to cook (no kidding, look at the recipe below) and taste superbly good! If you are preparing at least a four to five–course dinner at home to celebrate Chinese New Year and challenged by the amount of time you have, this dish is going to make your day…extra sweet (no pun intended). 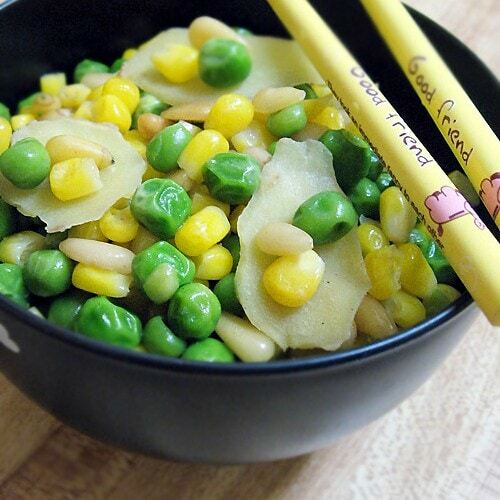 Stir-Fry Pine Nuts with Corn and Peas (金玉满堂): This Stir-Fry Pine Nuts, Corn and Sweet Peas of yellow-golden (pine nuts and corn) and jade-green (sweet peas) symbolizes: that prosperity and fortune fills your entire household and home. Heat a little oil in a pan. Add ginger and fry briskly till fragrant. Add in peas and corns and fry quickly till cooked (tender). Add in pine nuts, mix well. If the mixture is too dry, add the water and mix well. Finally, add salt and white pepper to taste. Serve immediately. Wow, this is a colorful dish, I like how simple it is with simple ingredients. Happy Chinese New Year. Thanks to BeeYinn for the great series too, and Gong Xi Fa Cai to you. The chopsticks – so.darn. cute. Happy Tiger Year!! Both the colour and ingredients of this dish are awesome and healthy. Good match with the festive atmosphere of Chinese New Year and full of meanings. I love simple dishes like this one more and more. Thanks for the great series of CNY, Bee. I believe all your readers enjoy reading the CNY series as much as I do. Happy Chinese New Year to all. Happy cooking and blogging, enjoy good health ! Christine, Happy Chinese New Year to you and your family…happy returns, health and happiness. A nice & refreshing stir-fry! Gong Xi Fa Cai to both Bee & Tigerfish! May the year of the Tiger brings you both an abundance of joy & luck! Same to you…Happy Chinese New Year! This looks like a wonderful dish to serve for Chinese New Year. Wish you a very Happy and Prosperous Year ahead! Loved this simple dish and the way you have added Ginger: sliced in wafers; beautiful picture too! I had a dish just like this when I visited a friend in Beijing and had a home cooked family dinner! I’m vegetarian, and his host mom was wonderfully obliging with this delicious dish as well as several others. Wow this dish is easy and simple. I will cook this this week! Perfect !! !I will cook ! hi there, juz wondering where to find pine nut in malaysia? Plz let me know where I can get good quality pine nuts in Malaysia kl.